Are you looking for the most beautiful, versatile and incredibly practical window dressings? Maybe you are looking for a child safe alternative to blinds? Perhaps you would feel assured by the peace of mind a lifetime guarantee would give you? Or rather you are interested in the designer good looks and style to enhance your room? Whatever you are looking for, Just Shutters Window Shutters Henley-on-Thames offers the above in abundance. We have the finest shutters and the very best local service; call us on 01235 424282. Your local shutter experts are husband and wife team James and Charlotte Chenery. They have an eye for detail and love transforming the homes (and lives) of local people in Henley. Couple this with the UK’s broadest choice of shutters, including our own Just Shutters exclusive ranges; all backed by our lifetime guarantee, we are the clear choice. With so many styles and finishes to choose from, our expert designers will help you achieve the perfect look for you. Whatever your style and taste, whether contemporary and bright or warm and traditional, or even bold and colourful; we can create the perfect shutter solution. We have over 8000 happy customers so we have the expertise, experience, passion and skill to enhance your room with our shutters. Alternative window solutions such as curtains and blinds can age and go out of fashion. Additionally, they can bleach, warp, fade and tatter. However, our robust and beautiful plantation shutters have been gracing homes for centuries. They offer a timeless elegance and style, furthermore, they do not fade or warp or bleach in the sun. Shutters combine designer looks with exceptional versatility. It is not often beauty combines with practicality, but with shutters you really can have the very best of both worlds. Shutters do not require laundering, they are so easy to maintain, they do not hold dust, mildew spores or allergens like fabrics or untreated woods. Additionally, shutters are child safe with no dangling pull cords or trip hazards. They offer lighting flexibility like no other product, giving you privacy and light, ambience without glare and furthermore security without compromising the view. With Just Shutters market-leading lifetime guarantee, whatever your reason for loving shutters, that love affair will last and last. 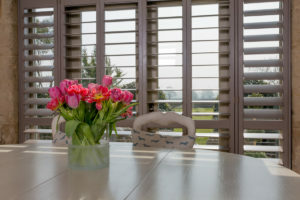 Just Shutters Henley-on-Thames are your local independent company owned by husband and wife team James and Charlotte. 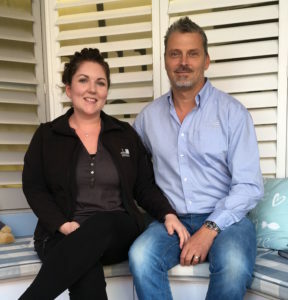 They are part our larger, much loved Just Shutters brand family. We have been the premier plantation shutter company for over a decade. Just Shutters put customer service and satisfaction at the heart of all we do. We couple the very best world-leading products with our own passion and local service, bringing you the very best of both world. But don’t just take our word for it, please see some of our customer testimonials below. Plantation shutters fitted in three areas of my house. Everything was 1st class, from measure, quote, build and also install. White shutters installed in 5 windows. You may also like to see Just Shutters Oxfordshire.